Having a good variety of lettuce types available covers much of the “visual interest” ground—reds, greens; flat-leaf, curled-leaf, frizzy leaf; and so on. Just radishes, carrots, and sweet peppers can add a lot of color and “bite” to salads; so also—as noted above—can sorrel and spinach. 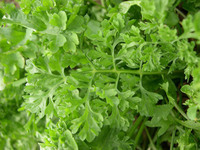 A number of the things we already grow as cooking herbs are also suited for use as garnishes or actual ingredients in salads—the aptly named salad burnet, mitsuba, leaf parsley (as noted above), and others. Nowadays, there is a host of non-lettuce greens of greater or lesser note used in salads, in good part, we feel, because nowadays it is very chi-chi to serve a “mesclun” salad whose quality seems—in social terms anyway—to be determined primarily by the sheer number of different things in it, and secondarily by the obscurity of those things. We have, with an effort, tried to wrench ourselves out of that “stamp-collector” mode, and correspondingly have tried to focus on those few “greens” that we think will really add something distinctive to salads, though we will certainly be doing some experimenting, too. We should further note that many gardeners feel that mid-summer and mid-winter are “dead zones” for lettuces, and thus that alternative greens are needed if salads are to be had; in summer, they grow things like leaf amaranth, in winter things like kale. But, at least in our climate, we should, by judicious cultivar selection and some commonsense measures regarding our lettuce-growing areas (see the page on lettuce), be able to get decent lettuce year round; if that proves so, the need for alternative greens reduces to those that are wanted to augment lettuce salads above and beyond the things we are already growing, as described in the notes above. We want lettuce augmentation, not lettuce replacement. In earlier years, before common sense had its say, we had planned all sorts of greens we now see little or no need for, but—since we did the spadework—we leave in here the information on them for others whose tastes and opinions on what’s wanted for salad greens differ from ours. The only salad stuffs we ourselves now intend to grow, besides lettuces and the veggies and herbs already enumerated, are: Corn Salad (Mâche), Cress, Orach, Purslane, and Miner’s Lettuce, plus some edible flowers, more for their look growing than for ediblity. These are things that we can either grow outdoors, under the same conditions and constraints as lettuce itself (to wit, Mâche), or things easily container-grown indoors (all the others). This fashionable relative of valerian goes by many names: corn salad, mâche, lamb’s lettuce, lamb’s tongue, field lettuce, field salad, rapunzel, doucette, loblollie, and fetticus (but do not confuse it with “lamb’s quarters”, a completely different green). It is a rather mild-flavored green, often said to have a faintly “nut-like” taste quality. Though most greens we consider to be additions to salads, mâche can make a small salad on its own when a few tangy bits—such as, for example, some sharp cheese, or some walnuts, or perhaps some zingy citrus slices—are added in. Mâche is commonly called a cool-weather plant, and it certainly is: it can literally be harvested through snow (it’s said to be safe down to about 5°F, probably a deal more with some protection, such as we plan for the winter-greens garden. (Mulch it with straw in the winter, as much to help find it as to protect it.) But there are also types that can withstand some heat. The basic distinction in cultivars is between “large-seeded” and “small-seeded”: small-seeded are for cold weather, large-seeded for warm weather (it is unclear if there are any material differences in cultivars within those two types). To get mâche in warm weather, be sure to seed before soil temperatures go above about 65°F. It is said that mâche will bolt at daytime air temperatures of about 80°F., but if you pick leaves while the plant is yet small, you may well (we are experimenting here) be able to keep a supply going through the summer by frequent re-seedings. Even in cooler weather, frequent succession seeding is wise, because the plant is naturally short-lived anyway (though slow to grow). It is thus wise to allocate permanent space for several plants. The plant does not need much space: even if allowed to grow luxuriantly, it rarely reaches a foot across, and common recommendation is to plant every 4 to 6 inches (since we want to pick the leaves while the plant is yet young, and thus small). The adventuresome with deep-dug beds might even try crowding it to 4 inches (making 9 plants in a square foot, a foot being a nice, standard “box” in a salad-greens bed). In any event, it would be as well to have at least a couple of square feet allocated. If you reckon at 6 inches, making 8 plants in 2 square feet, you would probably want to pull an old and seed a new plant every week; at 4 inches, making 18 plants, re-sow one every 3 days or so. But whatever your plan, if you detect a flower stalk starting on a corn-salad plant, pull the plant right then, as it is about to become useless. In summer, providing some shade will slow down the bolting process. Corn salad likes a loose soil, preferably a bit sandy, but is generally counted easy to grow, though—beware—the germination rate can be rather low. Also, mâche does not like to be transplanted, of fussed with much at all till it’s about ready for harvest, so wait for the leaves to be of a modest size before cutting. Verte de Cambrai aka Verte de Cambrais - very cold tolerant but takes longer to reach full size. Verte d’Etampes aka Vert d’Etampes aka d’Etampes - leaves very dark green, much thicker and fleshier than others, retains freshness longer than any other; rosette is somewhat more compact and stiff than most; remarkably cold-tolerant. Verte à Coeur Plein aka Full Green Heart aka Dark Green Full Heart aka Cabbaging - very distinct type: short, roundish, smooth, half-erect, stiff, intensely green leaves; forms compact rosette with full, firm heart; very agreeable flavor; holds quality well; very winter hardy. Grosse Graine aka A Grosse Graine aka Large Seeded Round aka Ronde à Grosse Graine - leaves large, comparatively narrow, greyish-green, thin, very tender; early-maturing, strong-growing form, larger than most. We rather doubt it makes any difference which cultivar you select within the two types; our own choices, at least for this year, are Verte de Cambrais (small-seeded) and Large-Leaf Round (large-seeded), which last is—we presume—the same cultivar called Grosse Grain and the other names listed above. The cress we use has the charming name Wrinkled Crinkled Crumpled Cress; it’s a trendy, fairly new selection from crosses between Persian and curled cresses, which leaves us with no idea of just what it’s correct botanical classification is, though seedsmen are listing it as a Lepidium sativum “garden cress”type. One grows it closely spaced (4 inches maximim) with frequent re-seedings. Or, perhaps best and easiest, one can also grow it indoors, in pots or trays, with frequent re-seeding. Besides going into salads, cress can be used to spice up sandwiches, so grow a good bit. Minutina, known in Europe as herba stella or erba stella (star herb) and also in the English-speaking world as buckshorn (or buckhorn) plantain, is an increasingly popular salad green. It is said to have a “mild, sweet” flavor (also described as “almost salty”), though perhaps its main charm is its shape and appearance (blade-like with small, serrated leaves, good, toothsome crunch). Although favored as a winter green owing to its cold-tolerance, minutina also grows well in summer, too, without becoming bitter. Sow the seed in place in either spring or autumn; seed it at about 6 inches—or perhaps 4 inches for the experimental with deep-dug beds. Pick it when it is young and tender, perhaps at 5 inches, else it may just flop over and rot. Watering is a bit touchy: you need to water it well to maintain the wanted succulence of its tender leaves; but if you over-water it, it will flop over and rot as if grown too tall, while if you under-water it, it will wilt and dry up. Just keep a careful eye on it day to day till you get a sense for what keeps it looking healthy. Though some say it has a long tap root, others seem to grow it without problem in small to medium pots. This stuff is nearly tasteless, but is quite pretty and well worth growing for its visual appeal in a salad. There are numerous edible Claytonia species, all in the Portulacaceae family—the purslanes. It ought to grow wild around here wherever there is some of the shade it likes, but we haven’t noticed any (but we haven’t exactly been out scouring the trails, either). There are no named cultivars (that we saw). Miner’s lettuce is not frost tender: indeed, it is commonly in leaf all year (and in in flower from May to July). It is notably tolerant of almost any soil conditions. As is common with greens, the young leaves are the best; older leaves can turn bitter, especially in the summer and most especially if the plant is growing in a hot, dry position. While individual leaves are rather small, the plant produces extravagantly. And besides the leaves, you can use the stalks and flowers as well. In summer, it likes—indeed, may require—some shade. One source (linked below) says: Growing claytonia is ridiculously easy. It is not fussy about soil, asking only consistent moisture. You might even plant it in the shade of a deciduous tree where other garden crops might languish. It will receive the sun it needs after the tree’s leaves fall. Though the seeds are tiny, try to sow them sparsely so you don’t have to thin them later. Rip out the plants promptly when they start to set seed (they’re easy to pull up). Otherwise, you will have a galaxy of claytonia plants the following year, and not necessarily where you want them. On the other hand, letting a few plants self-sow in the bed may prove a handy way to ensure a yearly supply of this elfin crop for your winter table. It seems to germinate best in the later autumn. Here’s the full article, from the Washington Post, whence that information came. This also we will grown in a pot (well, a tray actually) indoors, a method we recommend to all. A pleasant surprise to many gardeners is the large number of flowers normally grown solely for ornamental purposes that are in fact perfectly edible. Of course, “edible” does not necessarily mean “delicious”, but even there the surprise is pleasant. Moreover, many flowers with little taste—good or bad—can add great beauty to the appearance of a salad, or other dish, which in turn adds to its overall pleasingness. A complete tabulation of all the many edible flowers would be toilsome, as there are so very many. Our main purpose here is just to wake you up to what you may be missing in this area, so we will merely highlight a few leading candidates from the outstanding stars of the culinary ornamentals. A search-engine look using edible flowers will bring you masses of pages discussing the matter further (but especially notable is The Cook’s Thesaurus pleasantly illustrated page on edible flowers). Never eat a flower you have not first verified is safely edible. And never, ever eat any flower whose source and growth you are not well familiar with—any number of unpleasant poisons are often applied to flowers in the not-unreasonable expectation that they are not going to be eaten! Nasturtiums are not only delightfully pretty and colorful, but excellent garnishes for salads, having a peppery, watercress type of taste. Moreover, nasturtiums reportedly help keep some sorts of insects off growing crops, a nice bonus, so grow them as close as you can in or around your food vegetables. There are no culinary cultivar distinctions: use what looks nice to you. The basic choice is between stand-up types and the vining, trailing dwarf types. Do not confuse edible true Marigolds with Calendula Calendula officinalis types (though those are also edible). Marigolds used in salads add a modest citrus-y flavor. Pick any color that looks nice to you. Myths notwithstanding, California poppies have no sedative (or other minbd-altering) effectsa whatsoever. As with the other flowers mentioned above, feel free to choose whatever color or colors please you. Most traditional salad greens are, like lettuce itself, cool-weather fans, so in warm weather we are often, to some extent, improvising. Moreover, in mid-summer, when the supply of lettuce itself may diminish, salad greens can not only add interest to a salad, they can eke out its actual bulk by partially replacing lettuces. Amaranth can be grown for either its seed, which is used like a grain, or for its leaf, which is a potherb. Although any variety will do for either use, certain kinds have been developed that are somewhat better for one use than the other. (As a green, amaranth leaf is sometimes known as “Chinese spinach”—not to be confused with “Malabar spinach”, yet another leafy green—or as “Callaloo”.) Amaranth is also occasionally grown for its floral value, in particular a type known as "Joseph’s coat". The chief value of amaranth to the home gardener is that it is a green that actually prefers hot growing conditions, and is commonly described as easy to grow: indeed, in some areas it is considered a weed—“pigweed”, to be exact). As with most plants described as “potherbs”, the younger, more tender leaves can be eaten raw as additions to salads, while the older, larger leaves need steaming, parboiling, or some similar treatment to be edible (just as with that most popular potherb, spinach). Here, we deal solely with growing it for use raw as a warm-weather salad ingredient. The early flower spikes and the youngest leaves, both of which are slimy, can be eaten raw. . . The early leaves of spring are mild in flavor. Later in the season [you] need to wait for leaves less than five inches or the just sprouted flower bud if [you] want to use them as a uncooked green. . . [T]he large leaves that are so abundant later in the season, along with the leaf stalk, are good as a cooked vegetable if there is a strong flavor to complement the rather bitter, meaty flavor of mature amaranth. . . [T]he young shoots and leaves have a slight lemony taste. . . 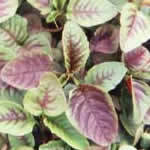 Growing amaranth is easy. In fact, it is, in a sense, too easy: the plant is highly invasive, and—especially in rural areas—it should be an absolute requirement that the gardener be sure to pull out all amaranth plants before they can possibly release seed (or you may be in deep, uh, water with your local noxious-weeds control board!). If you are growing amaranth only for fresh greens—not cooking greens or seed—a spacing of 6 inches quite suffices in a deep-dug garden bed. Orach—much more commonly grown and used in Europe than in the U.S.—is commonly described as “mild” and “spinach-like” in taste; it is also known as “mountain spinach”, “French spinach”, “sea purslane”, and “butter leaves”. Though there seem no named cultivars, there are three general varieties: red, green, and white. There is some indication that red is culinarily inferior to the other two, of which white may be slightly superior to green (but red and green are far more commonly offered than white, or a sometimes-cited “golden”, which may be another term for the white variety—so much so that we cannot find seed for anything but red or green.) Nowadays you can buy a color blend commonly called “Aurora”. Though orach is nominally a cool-weather crop much like spinach, we list it here because not only will it grow through the summer, it has the excellent quality that—unlike, say, spinch—its leaves do not turn bitter when it bolts, so it will provide useful salad greens till frost kills it off. You can direct-seed it “as soon as the ground can be worked”, as the traditional phrase has it; figure on the usual one square foot per plant. Just take the smaller, younger leaves on an as-wanted basis. Orach is famously tolerant of extreme soil conditions, from acid to alkaline. Also normal for Orach, as for many potherbs, is its tendency to become an invasive weed, so we repeat the standard advice: do not let any plants drop seed Better yet, grow it in a container. This common warm-weather substitute for real spinach is native to beaches (hence its other name, “sea spinach”—though it is also called at times “warrigal greens”, “botany bay spinach”, or “Cook’s cabbage”). It is used as a direct substitute for its namesake. Cooked, it is virtually indistinguishable, but raw—what we are interested in here—it is not quite the same. As one Australian cook put it, Remember that even though true spinach can be enjoyed raw, New Zealand spinach can’t. Not that it’s indigestible, it just doesn’t taste great; in fact, raw New Zealand spinach doesn’t taste like much at all. Still, it can be used to augment salads, and it can even be used in “spinach salad” recipes if the other makings, and the dressing, add a deal of flavor on their own. New Zealand spinach is quite hardy once established, but is notoriously troublesome to germinate. Opinions vary on planting: some say it wants warm soil, others say they’ve had better results in cool soil. Take a shot on planting when the soil is cool—if that doesn’t get you a crop, you can just re-seed when the soil has warmed. Before planting, soak the seed in warm water for a full day. Some recommend making a small nick in the hard seed coat, using a pocketknife or the like, just prior to planting. It’s a wise idea to put several seeds at each planting spot, owing to the poor germination rate. Allow the standard greens square foot or so per plant. Once the plant reaches a modest size, you can begin taking leaves on the usual “cut and come again” basis; the plants should last all season. Even when you don’t have a need for some leaf, keep picking the top 3 to 4 inches of stem, and the leaves as the shoots grow back. It is surprising that this green is not better known (compared, say, to New Zealand spinach, which you can buy in most any supermarket), in that it is widely reported to be even closer than New Zealand spinach to real spinach, especially raw, and is very easy to grow in even the hottest weather. Several sources note that the leaves are mucilaginous; a home gardener remarked that you might notice this eating a leaf of it raw in the garden, but not in a salad. It is noteworthy that the leaves are often used in Asia as an ingredient for soup expressly owing to that mucilaginous quality, which makes it a thickener—one immediately thinks of okra and gumbo. Such a use would be an interesting experiment, but its normal intended use remains the augmenting of salad greens in hot weather. Malabar spinach is a climbing vine, so it needs vertical growth room and support—or it can be grown in a hanging container and allowed to trail. And, though very heat-tolerant, it is correspondingly very frost-tender: night temperatures much below about 50°F on a regular basis are bad for it. This, therefore, is one green that you might consider starting indoors in a pot before transplanting out. As mentioned (and shown here), it can be pot grown, but some gardeners have said that it thrives best in ground. It grows fast enough and high enough to be a decorative cover, albeit an annual one (if you put it away from your main garden, you can let it self-seed, which it reportedly does readily). When seeding, wait till all risk of frost is past, then plant the seeds a good inch or so deep. Figure (again!) on the greens-traditional square foot or so for ground, but don’t forget to provide something for it to grow up—a trellis or fence. While it can stand some drought, you can scarcely over-water it. Like so many interesting—and, in other lands, treasured—salad greens, in the U.S. purslane is thought of mostly as a weed (little hogweed—also pusley, pussly, kitchen purslane, garden purslane, and fatweed.). It is described as having a “mild, sweet-sour” flavor with a peppery overtone, and a chewy texture. In Europe, the succulent leaves and young shoots are used in spring salads, the older shoots as a pot-herb, and the thick stems of plants that have run to seed are pickled in salt and vinegar for winter salads. Purslane is a potherb, and so can also be cooked; like Malabar spinach (described above) or okra, its mucilaginous quality is great for thickening soups and stews. Purslane is available from seedsmen in two basic types: green and golden. Some say that golden purslane is P. sativa, while only green is P. oleracea; it is also said that only the golden type comes true from seed. In any event, there seems to be no culinary distinction between the two. Purslane is very easy to grow—again, far too easy, for it quickly invades and becomes an ineradicable weed (the 7th worst in the world); even a small bit of stem will root and grow. It thus makes excellent sense to keep purslane growing in a pot (and never throw any least part of a purslance plant where it might take root, such as a compost heap, or even a sidewalk—purslane notoriously takes over the cracks in paving). It is very heat-tolerant and drought-tolerant, though if you are growing it, you want to keep it well watered to maintain its succulence. Plant by basically just strewing the seed where you want it (again, much preferably in a pot); it can be allowed to grow rather thickly, say 3-inch spacing. Purslance much prefers a sunny location. It is low-growing, and tends to trail; a pot can thus be hung, and the plant allowed to trail (but mind, don’t let it reach the ground or it’ll root there!). You can start sowing as soon as it is no longer really cold; purslane plants tend to last about 3 months, so you may want to re-seed in mid-summer, or even every couple of weeks, depending on how much you take how often. Fall cold will kill the plants back. Take purslane for fresh eating only when the plant is young—the flavor deteriorates badly once it starts to bloom. You can take whole branches (the stems are perfectly edible) till blossoms appear, at which point you can pull the plant or leave it for the look of its delightful blossoms (it is commonly grown purely as an ornamental). These are the greens that just won’t do well in mid-summer, period the end. Radicchio, aka red chicory, red-leafed chicory, red Italian chicory, chioggia: the colors are delightful. The leaves are somewhat bitter, but sweeten slightly in the cooler day temperatures of autumn. Radicchio is just a chicory that is red (or red-spotted) and tends to head. There are numerous cultivars (we counted 21 before we gave up), all touted by someone, somewhere, for something. In commercial use, the chief determinant of “quality” is the percentage of plants that head, for radicchio is notoriously low-producing; we home gardeners, growing just for our tables, don’t care: we can and do sow several seeds for each plant wanted, and just don’t plant out the runts. After seemingly endless hours scouring the literature, we reckon the types Castelfranco Variegated (aka Variegata Castelfranco and Castelfranco Valdamo), a semi-heading type with a less-traditional coloring, a beauty (that’s it at the left), and Palla Rosso, a more traditionally colored type, seem the best to try as a beginning. Radicchio is grown much like lettuce, though it takes somewhat longer to mature (80 to 85 days). It is moderately frost-hardy: tops will reportedly withstand temperatures down to 20°F. or so, at least for short periods. While it can be grown through fairly warm, or even hot, weather, plants that mature in such conditions are excessively bitter, so such growing is ill-advised. With care, though (such as “hoop greenhouses”), radicchio—again like lettuce—very probably can be grown throughout the winter in climates that, like ours, are not excessively cold. (In fact, a well-known book, Four-Season Harvest, by Eliot Coleman, describes winter gardening in Maine!) Radicchio can withstand some shade, and may even prefer it when it is warm; it is also said to do well in containers. Timing seeding for radicchio is tricky in our climate, owing to the need to avoid growing it in summer heat—we need our spring-planted crop out by, say, mid-June, to avoid temperatures over 80°F. or so; that means—for direct-seeding—planting literally “as soon as the ground can be worked” in the spring, say March 1st or so. (The drawback is, of course, that all the spring-planted radicchio, since we can’t plant much earlier or later than that, will come ready nearly all at once.) But, as radicchio will grow well even in quite cold weather, possibly right through the winter with some care, we can start seeding again in late summer—July seems generally suggested as the time to start (early if it’s a cool summer, later in the month if not). From that date, we can keep on succession-seeding at a rate determined by our available space and our need for the plant. If winter growing is indeed practicable, then we just keep seeding till mid-March or so. Being smaller than lettuce, radicchio can be spaced at 6 inches in a well-dug bed, giving four plants to the square foot. Germination is usually rapid, a week or less, with the ideal soil temperature being 60°F. to 65°F. Be aware that radicchio is notoriously low-germinating. For home gardeners not planting fieldsful of the stuff, the solution is to just generously multiple-seed for each wanted plant. Whatever you do, do not allow growing radicchio to dry out or you will end up with an inedibly bitter disaster. Radicchio is shallow-rooted: it is best to water moderately but frequently, rather than to give large amounts occasionally. If your culinary life depends on having radicchio available all the time, you could grow some indoors in pots during the summer months (allowing appropriate backtiming to figure when to seed them); they are supposed to do well in pots. Escarole is a rather slow-growing vegetable—typically 90 days to maturity, so—it being a cold-weather crop—spring plantings are pretty much right out. Fortunately, escarole can withstand pretty low temperatures, so one can probably, with due care, grow it through the winter hereabouts (or, as the Coleman book cited above suggests, anywhere). Begin seeding in mid-July or so, and keep on till, well, who knows? Into March, one would think, for sure, and possibly till April (which would mean harvest till the end of June). Culture is much like that for lettuce, with the same one square foot allocated per plant. We feel that one or at most two plants will suffice for anyone not a fanatic, since you can take leaves as needed on the standard cut-and-come-again basis. Be sure to water frequently: water stress can greatly increase bitterness. Here is an essay on the chicory/endive greens that goes into the confusion over names in the group. Chicory is very similar in general to escarole, described above, save for its appearance; the characteristic Italian type, that of frizzy stalks (as shown on the left) is commonly called “Catalogna”. In flavor, it is pretty much like escarole and even radicchio (though, as a stalk, it is a bit crunchier to the tooth); it is for their differing appearances and textures that one grows more than one of these mildly bitter garnishes. In any event, virtually all the comments above about escarole apply with equal force to endive. The Catalogna-type chicory shown here, which is the prettiest for salads, is sometimes also called “Italian dandelion”, but it’s not a dandelion, nor is it related to dandelions (also, extra-confusingly, culinary dandelions are often called “Catalogna” in catalogues). There are named chicory varieties, even within the Catalogna type, but no information we could find outside a few specialist seedsmen’s catalogues—which we consider unreliable sources—about differences in taste or productivity: pick a seedsman and go with it. What we’d go with is a type called Romanesco da Taglio. There is reason to hope that these things will grow year-round, but consider the designation tentative and experimental. The culinary dandelion is only a somewhat improved selection from the wild dandelion, the same thing that keeps suburbanites with lawns from sleeping well. It makes a garnish for salads for those with a definite taste for bitterness; all others would be well advised to use it quite sparingly (but not to pass it completely by). Considering its heritage, the dandelion—like many of the weedy salad greens—should be well guarded against going to seed. While no place whatever is likely to be exactly free of dandelions, you don’t want to be responsible for a sudden major infestation, on your property or anyone else’s. One presumes, then, that initial seeding is best accomplished in early spring, with frequent succession seeding thereafter. The growth pattern is simple enough: the first edible portion to appear is a reddish tangle of leaves, from which the greens will then grow—those being the leaves above the surface. They must be gathered before the plant blooms to be culinarily useful. The best time to gather them is just when the bloom bud appears and before the stalk grows, else they will be too bitter even for fans of bitterness. And you need to cut them down before they can bloom. Once a given plant (you scarcely need a fieldful of them) is well established, a quick process, cover it with straw (or, as mentioned above, an upturned pot) for a couple of weeks, then harvest the blanched leaves; the blanching should produce leaves of a whitish-yellow and—most important—modulate their inherent bitterness. When using your harvested leaves, the sources all say to gently tear the leaves rather cut them, so as to retain the flavor. You can try following Mrs. Grieve’s advice to see if you can maintain a growth right through the winter. Miner’s lettuce is a member of the Portulacaceae family, which is basically the purslanes, many others of which are also herbs or potherbs. The chicories, including radicchio, are members of the useful Asteraceae (formerly Compositae) family, the asters, as are lettuces and many other edibles. Salads—mixes of raw leafy vegetables dressed with an oil—are probably about as old a prepared human foodstuff as there is. Whatever came to hand that was known not to be poisonous was probably used as soon as that non-toxicity was definitely known. Naturally, the run of leafy greens being rather bland in taste, those with some flavor, even if that be sharp or bitter, was valued. The word Chicory—the name of the plant in practically every European language—is probably derived from the Egyptian word Ctchorium. Originally used to describe the wild plant, the name over time came to also denominate cultivated forms. Use of the wild foliage as human food almost surely antedates recorded history; cultivated chicory dates back to at least as early as 5,000 years ago and the Egyptians, who valued it as a medicinal plant; but the Greeks and Romans used it as a true vegetable, as well as in salads—Horace, Virgil, Ovid, and Pliny all mention it, and Galenus dubbed it the “Friend of the Liver” owing to its reputed beneficial value for that organ. The class of chicory we call “Radicchio” was only developed the late 1860s; a Belgian garden consultant named Francesco Van Den Borre, visiting Italy, derived it from local chicory varieties of the Veneto region of northern Italy. If there’s a clear history of Miner’s lettuce on the web, we’ve missed it. We do know that it was a common foodstuff of the native Americans, and so guess that it’s native to the Americas. It’s said that the natives—lacking vinegar—would plant the stuff near ant’s nests, so that the greens would become flavored with formic acid (which ants secrete) to add tang. It was popular in the Gold Rush days (hence its common name) because it was, literally, freely available, and supplied some much-needed Vitamin C to old-west diets. Recorded nasturtium history starts in the 16th century, when Spanirds returning from Mexico and Peru, apparently the original home of the plant, brought specimens back to Europe. The plant gradually became popular in Spain, then Portugal, and eventually made their way to France, England, and—by such a roundabout way—to North America. The name nasturtium derives from the Latin words nasus, nose, and tortus, twisted—“nose twister“. Salad green that will impress. Mix up some lettuce, add some dress. Stir it up, sit down and fress. You loaded this page on Friday, 19 April 2019, at 16:33 EDT. It was last modified on Wednesday, 30 January 2019, at 03:45 EST.